The Arkansas Foodbank is proud to announce Hollyann and Josh Neal as our 4th Annual Harvest Night Chairs. 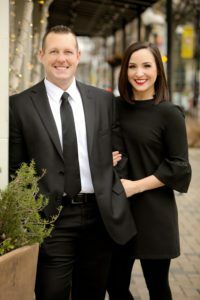 The Neals are leaders of the Foodbank’s mission; Hollyann through the Foodbank’s Harvesters young professionals group, and Josh through Arvest Bank’s Million Meals Campaign that kicks off April 1. The Neals have been active with the Foodbank for several years, and we are grateful for their help in raising awareness, food and funds for the Arkansas Foodbank. Presented by Riceland Foods, Harvest Night is the marquee event for September’s Hunger Action Month. Join us for an evening of family fun including a bounce house, petting zoo, photo booth, and face painting. For adults, we will have BBQ & Catfish, live streaming of SEC football, craft beer, wine and a fabulous silent auction. We are also excited to partner with Soiree for our signature fundraiser. Check out their feature on the event and the Neals in Soiree’s August issue. Save the date for the 4th Annual Harvest Night on Saturday, September 7, 2019 at the Arkansas Foodbank Warehouse. Tickets and sponsorship information available here.